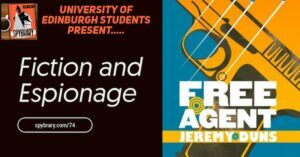 Free Agent by Jeremy Duns on the Spybrary Spy Podcast We are thrilled to transmit the first in our series of commentaries on spy novels read by the students of Fiction and Espionage at the University of Edinburgh. Today's group tackle the first novel in the Paul Dark series called Free Agent and written by Jeremy Duns. Free Agent, the first in the 4 books based on spy Paul … [Read more...] about Free Agent by Jeremy Duns (Commentary) Ep 74. Fiction and Espionage series introduction by University of Edinburgh's Penny Fielding and Simon Cooke. Spybrarians, we are in for a real treat. Our good friend Professor Penny Fielding and her colleague Professor Simon Cooke of the University of Edinburgh bring us 5 spy lit podcast episodes which are recorded by students of their Fiction and Espionage course. 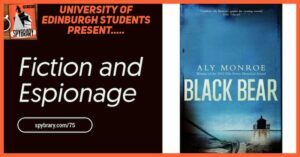 Penny points out that these … [Read more...] about Fiction and Espionage – University of Edinburgh Intro.